So I picked up a copy of Poisoned Blade at ALA but it’s kinda hard to review or read a book if you haven’t read book 1. I honestly knew nothing about this and figured why not. I’m starting to realize that this why not mentally is a blessing and curse. Jessamy’s life is a balance between acting like an upper-class Patron and dreaming of the freedom of the Commoners. Jessamy, Jes, is what people in her society call a “mule”. Her father is part of the upper-class Patron society but her mother is a Commoner. It is illegally for her parents to marry. So for the last 20 years her parents have been defying society and living together as if they are a married couple. Jes’ father imposes a strict home-life so that no one can doubt her Patron heritage. But away from her family, she can be whomever she wants when she sneaks out to train for the Fives, an intricate, multilevel athletic competition that offers a chance for glory to the kingdom’s best competitors. SOOOOO MUCH more goes on in this book, that if I tried to add it to the synopsis it would be a couple more pages long. Race, gender, political issues are just the tip of the iceberg for this book. Elliott is brutal honest and at times this book is difficult to read because it kinda slaps you in the face with just how much women are second class citizens, never mind the third class citizenship of Common women. That being said, there was never a point when I got sucked into the story. I definitely was forcing myself to read this because hello book two comes out soon and I gotta read it before it does so I can review it. Everything felt flat. So much goes on in this book and yet nothing really happens. It is as if to make up for the brutally honest parts, Elliott avoids developing the plot of the story or the characters. Even the Fives, the athletic competition, is basically lame version of Wipe Out. WHY am I reading book 2? I don’t know but probably to tell you how bad it is, so you don’t have to suffer through it. 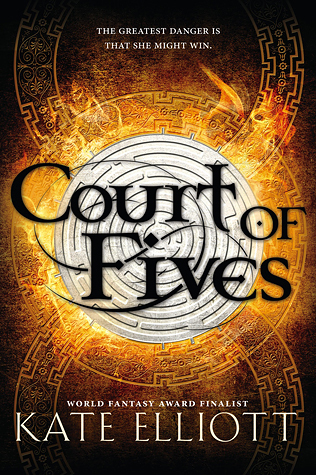 This entry was posted in Young Adult and tagged Court of Fives, Kate Elliott, Young Adult. Bookmark the permalink.